Ilkka wrote: As of very little we were rewarded with candies, at least we who are born in 70s-80s and so on even more. Reward comes from there, something so sweet and everytime we do anything that needs a reward, we gotta go and get em if not already have them candies. Right. My family used to get those Brach's jelly candies. Memories. I don't think they even make the ones I'm thinking of anymore. Did your family ever try to get you to eat as a little tike by promising that there would be a little birdie at the bottom of the bowl if you finished your food? There's another reward system. Darn that bird, it always flew away before I could see it! animus wrote: You might want to start eating chocolate with more cocoa and less sugar in it. Your taste will change over time. You will develop an appreciation for those 90% cocoa chocolates that are probably still a bit too bitter for you, today. But you'll get there. Thanks a lot for the suggestions. I actually do like the dark, less sweet chocolate. I'll try that. They put so much soy in chocolate and everything else now; so much of the food tastes pretty bad. Bread with soy actually stinks when you smell it. I've become much more aware of what food manufacturers put in their products. I always look for MSG, hydrogenated oils (which don't break down in the body) and my favorite -- propylene glycol. If I wanted a degreaser for my car engine in my food I would of asked for it! Scary story about those carrots. PHIon wrote: Right. My family used to get those Brach's jelly candies. Memories. I don't think they even make the ones I'm thinking of anymore. Did your family ever try to get you to eat as a little tike by promising that there would be a little birdie at the bottom of the bowl if you finished your food? There's another reward system. Darn that bird, it always flew away before I could see it! In our cultrure I haven't heard of that kind of bird story. Can't remember but I think that there was no such reward for us, at least not in the 90s when I was little because of economic depression at the time. Our grandma did give us candies though and made crepes with jam still she makes them crepes. However I have had enough of those sweets, don't eat but only few of them nowadays. Mom used to make all sorts of pastries too, then there was coca cola and other sugary drinks. I remember that our parents were quite persistent about emptying the plate, also the saying "don't eat with your eyes", that was if we were taking too much food on the plate and couldn't eat because of the obvious reason. Didn't want to throw away good food and all that. Even though me and my 2 brothers were raised that way, I am only one that follows through it sort of. Older brother sometimes or always has leftover food on the plate he eats very slowly and is overweight, younger brother is the opposite he eats irregularly and is slim, but I think he eats all from the plate, dont know because haven't seen him eat in his home, exept fast/junk food what he consumes alot more than I. Sometimes, rarely though I accidentally overcook the food I make so it gets a little burned taste, but I still eat it, because of principles. I think that I have thrown away burned food only once the bits that were tasting so bad that I had to get rid of them. But I generally get mad from 0 to 100% in an instant if I do such a mistake. Thats what it is like to be a bit of perfectionist at some things that matter the most. I think thats why I understand Gordon Ramsay so well, we are alike minded, well he even more than I since I don't bother to create such foods than him. I've worked in the food industry and their drive is "long shelf life," not health. Longer shelf life = more profit you can make on it. The chemicals in food are used for three things: shelf life (preservatives), visual appeal (coloring) and sweet taste. Also, most food is dowsed with a peptide known as ghrelin (the hunger hormone), which is responsible for that hunger feeling from an empty stomach. Normally, the stomach stops ghrelin production when it starts to stretch with food, giving that "I'm full" feeling. But when added artificially, there is no off switch--so you overeat. Now what they won't tell you on Wikipedia is that they harvest ghrelin from the stomachs of cattle being shipped for slaughter--and starving on the ride. And YES, it is on your "vegan" processed foods, because it is considered a neutral hormone, not "meat." Having been born in the 1950s, I can tell you that back then food was mostly food, not chemicals. Milk was delivered every morning by a local dairy. Yeah, I remember my mother and grandmother having talked about this. I've been in many antique stores over the years, and you still see lots of old memorabilia dedicated to this bygone age; metal signs showing the local milkman delivering fresh milk to excited little children. When she was a kid, my mother used to get a kick out of Betty Boop, who had a 'thing' for the ice man, i.e. the muscular fellow who delivered large blocks of ice up to her third story apartment. This still does happen, quite frequently; but the end products have been relegated to COOP and farmers markets, as well as higher end restaurants. The big chain markets and restaurants won't touch it. Still, it is encouraging to see that there are still numbers of small farmers growing 'organic' fruits and veggies (before the term 'organic' ever became a thing). BTW, pizza is actually categorized as a "veggie" in schools because it has tomato sauce. Yeah, I remember reading that story a few year's ago. For about 5 minutes, it became the talk of the town. Then people got distracted by something else. Yeah, it's the visual appeals part of it that I've most often dealt with in terms of sharing food with others. When you walk into a mega grocery store, (any chain store, really), you'll see bins filled with veggies that all 'look' the same. Perfectly shiny, perfectly shaped. Doesn't look quite natural. I'm a big fan of 'pulp' in juices, particularly fresh-pressed apple cider. Last year, I was here at the farm sitting in on a 'pickling' class. One gentleman brought by some of this fresh-pressed cider. All of the delicious pulp had settled to the bottom. I noticed that he did not shake the bottle. Just before serving, I stopped him and said, "Hope you don't mind, but can I ask that you please shake up the bottle first to mix through the pulp?" I got odd looks from the rest of the folks seated at the table, but proceeded to say to them, "There is a ton of flavor in the pulp." Just a few days ago, we were picking delicious crab apples off the tree out front. I offered one to a visitor, who proceeded to say, "I don't want a knobby apple" (the apple was oddly shaped, but still delicious.) Many people (apart from those who actually do engage the local farmers, and who do shop at the COOPs and the farmers markets), don't even know what real food tastes like anymore, and that's frightening. Aesthetics have become more important than taste. Oh my. Do you happen to know how exactly they harvest it? Seems like some fine amount of work would need to be done to extract it from the gastrointestinal tract. I think that most of us have seen those nightmarish videos of animals in slaughterhouses, but what you don't see is what happens to the animals after they are killed. So much for labeling, eh? A few week's ago, I heard on the radio that McDonald's has now developed a new menu, one that includes 'freshly cracked eggs' and 'Artisan Chicken', "completing a major commitment to only serve chicken not treated with antibiotics important to human medicine* nearly a year ahead of schedule." People really will fall for anything, won't they? Just wanted to say txs for this thread. I've stopped having sugar with the 2-3 daily coffees I ingest and its starting to show..
Lozion wrote: Just wanted to say txs for this thread. I've stopped having sugar with the 2-3 daily coffees I ingest and its starting to show..
You know I quite using sugar in my tea many years ago, just plain loose tea brewed every day. Enjoying the taste of different flavors. You should try different types of coffee to get the perfect flavors out of them if you wanna take the "experience" to next level. I dont like coffee at all, but I know that there are many different types of coffee as tea also. One thing I learned of coffee from this local roasting factory where I get my tea from too, is that coffee tends to stay good for only several days after the beans are being ground up. The best taste comes from the freshly ground beans. In our country there still are majority of old model coffee makers that use only ground coffee, don't know much about other countries. Coffee is also most popular drink in our country, thats why it is in almost every household. Ilkka wrote: In our cultrure I haven't heard of that kind of bird story. Can't remember but I think that there was no such reward for us, at least not in the 90s when I was little because of economic depression at the time. Our grandma did give us candies though and made crepes with jam still she makes them crepes. One side of my family is Lithuanian so maybe the tradition originates from there. Now I want to research that a little. The bowl we were given as little ones had a bird painted on the bottom and if you didn't eat all your food you didn't get to see the bird. But sometimes I remember being told the bird flew away even though I did finish. The details are sketchy but that's pretty much how I remember it. I bet those crepes are good, too. I wish I had my grandmother's old recipes but she kept them all in her head! They're all gone now. I've had to experiment with recipes from cooking shows to try to recreate some of the old meals we used to have. If it's that easy to lose family recipes, I'm seeing an analogy to how easy it is for history to be wiped out in people's memories within only one generation. PHIon wrote: The bowl we were given as little ones had a bird painted on the bottom and if you didn't eat all your food you didn't get to see the bird. But sometimes I remember being told the bird flew away even though I did finish. The details are sketchy but that's pretty much how I remember it. Yea, this bird thing seems that too "weird" to my ears so I have no recollection of it what so ever, but have you asked other country men about that. It might be a family tradition also. Family that have plates with bird drawings on them. I remember our plates having some pictures maybe flowers or other stuff, plates that grandma had flower pictures and she still has them. Just had a sort of a memory flashback a picture of plates and saw that they are/were plastic and dark blue one and orange one in color. Since it was in the mid 80s, I think the plastic is pretty much done for nowadays, it was very hard and therefore brittle. PHIon wrote: I bet those crepes are good, too. I wish I had my grandmother's old recipes but she kept them all in her head! They're all gone now. I've had to experiment with recipes from cooking shows to try to recreate some of the old meals we used to have. If it's that easy to lose family recipes, I'm seeing an analogy to how easy it is for history to be wiped out in people's memories within only one generation. Not anymore they are not. Grandma isn't getting any younger thats for sure, I think its her memory thats why. I can't even say for sure if they ever were so "good" I mean we only tasted the sugary stuff, because we used it alot. One reason to have alot of caries and the fact that we weren't brushing our teeth as often as we should've. https://www.independent.co.uk/life-style/health-and-families/breatharian-couple-food-free-lifestyle-diet-not-hungry-2008-camila-castello-akahi-ricardo-ecuador-a7792841.html wrote: Camila Castello, 34, and Akahi Ricardo, 36, are what is known as “Breatharians”. They say they eat just three times a week, with each ‘meal’ consisting of just a piece of fruit or some vegetable broth. On the same subject a new film released from the Russian 'no trees on earth' guy talks about 'bacteriophages' and 'phage therapy' to kill bacteria and candida in our gut. These bacteriophages are found in natural spring water, rivers etc are have the ability to heal, which I assume is the same idea as 'living water' or 'holy water' to heal, like the healing wells from old. As the medical profession began to become a business it chose antibiotics instead of the phage therapy. Antibiotics needs to be changed every 4-5 years (or sooner) as the bacteria adapts and the antibiotics no longer work. Doctor: "These antibiotics don't work. " Salesman: "Well why don't you buy these! " And a quick look on google shows that they are now 'considering' phage therapy as an alternative to the now dwindling antibiotic efficiency, about 100 years to late. wikipedia wrote: Infected hosts leave their canopy nests and foraging trails for the forest floor, an area with a temperature and humidity suitable for fungal growth; they then use their mandibles to affix themselves to a major vein on the underside of a leaf, where the host remains until its eventual death. 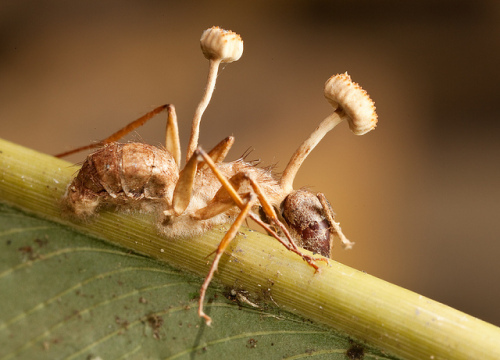 The process leading to mortality takes 4–10 days, and includes a reproductive stage where fruiting bodies grow from the ant's head, rupturing to release the fungus's spores. O. unilateralis is in turn also susceptible to fungal infection itself, an occurrence which can limit its impact on ant populations, which has otherwise been known to devastate ant colonies. Could this mildew/fungus weaponry be linked to the Alzheimers/dementia take over of our brain, the book Grain Brain (https://www.amazon.co.uk/Grain-Brain-Su ... 1444791907) links diet high in grains and sugar with Alzheimers (called Diabetes type III), see how the brain rots away. Coupled with all the endocrine disruptors in the food and even in the packaging with all this food being packaged in plastic. Maybe we are eating ourselves to conformity and eventually death. From what I've read here though, would the trees need a physical connection like this to communicate? Antibiotics needs to be changed every 4-5 years (or sooner) as the bacteria adapts and the antibiotics no longer work. Antibiotics only adapt if they are used before the infection starts. It is important to remember to not take any antibiotics in advance, because they are likely to build up a tolerance for the antibiotics that way. For natural antibiotic garlic is my choice. However it needs to be raw when consumed, since allicin is destroyed with heating. Look it up if you are more interested. Fruit sugar I think is much less toxic than processed ones. Especially fructose that one goes straight to liver, it is that diabetics might benefit from that sugar, but not in processed form (definetely not in processed form no matter what anyone says). Dunno what my grandpa used to eat mostly, but in his late 70s he got demented and got diagnosed with Alzheimers. He passed away in his early 80s, about 8-9 years ago.